Sandwiches have just got a whole lot easier to buy. Apple Pay – the contactless payment system in all iPhone 6s and Apple Watches – has just launched in the UK. With 74.5 million iPhones sold last quarter, and millions of Apple Watches sold to date, a lot of people are ready to buy a halloumi and spinach wrap with their phone today. 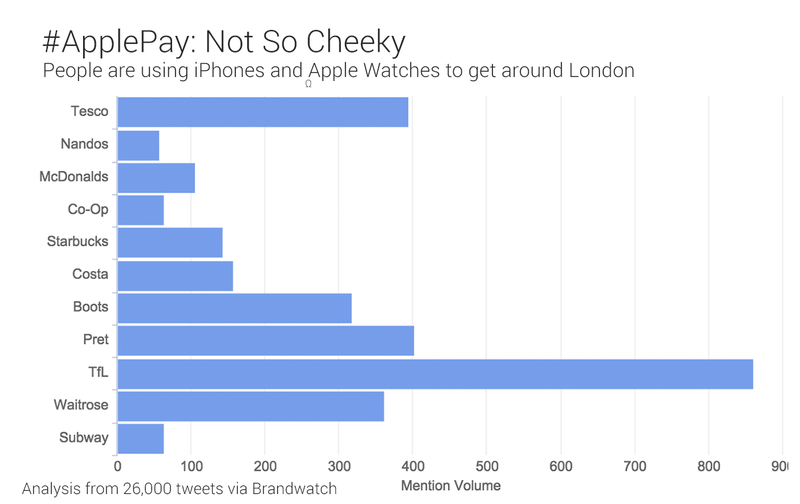 By analyzing 26,000 online mentions of the Apple Watch UK launch, we’ve assembled an unwilling focus group of 15,789 people. We’ve learned about their spending habits – and that, on the whole, it’s not working so well. Is the this the first step in Apple’s financial services takeover? Certainly, the ease of use and ubiquity of Apple Pay is making brick-and-mortar banks much less necessary. Why carry around an extra card when you’ve got your phone on you anyway? It’s a matter of time until no bank branches exist at all. In the UK, 14 banks have confirmed they’ll be using the service. On Tuesday, the service launched with support for five banks. HSBC was originally slated to be in the first batch, but slipped back due to technical difficulties. 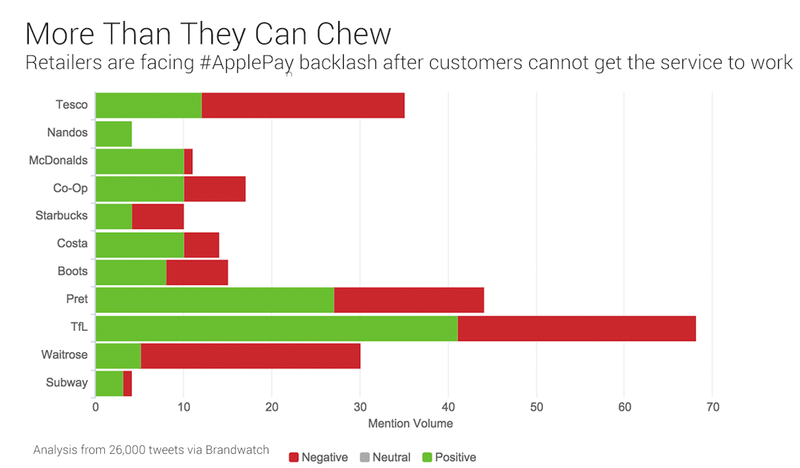 It didn’t escape unscathed, with negative mentions outweighing positive ones 5:1. Banks which launched on Monday, however, have mad a much more favorable response. 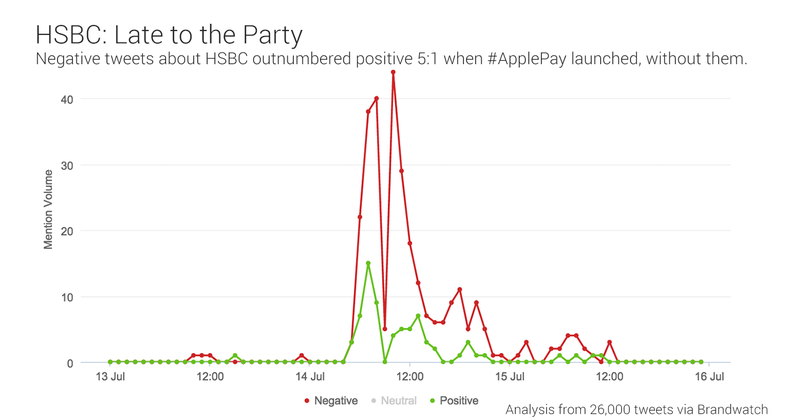 All of them – except Santander – have seen an over 50% positive reaction. NatWest has been the consumers’ favorite. 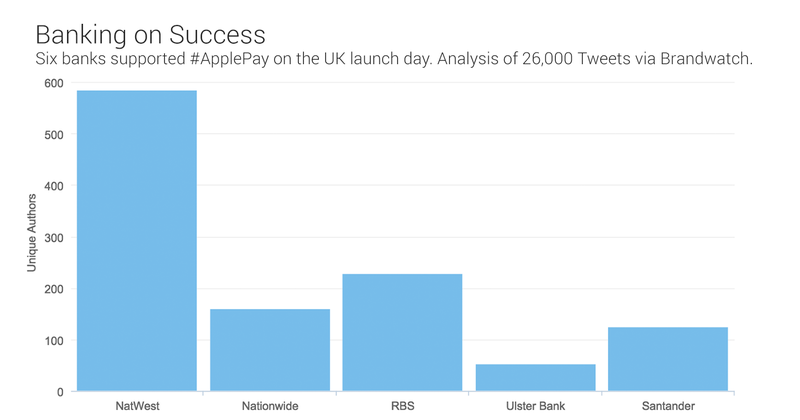 With 583 NatWest customers tweeting about their use of Apple Pay, it’s had double the uptake of its nearest competitor: RBS. RBS itself has 226 unique authors, Nationwide has 158, Santander has 123, and Ulster Bank of Northern Ireland has 51. Shops don’t have the same support issue that banks do. If the shop you’re in has a contactless card reader, you can use Apple Pay. 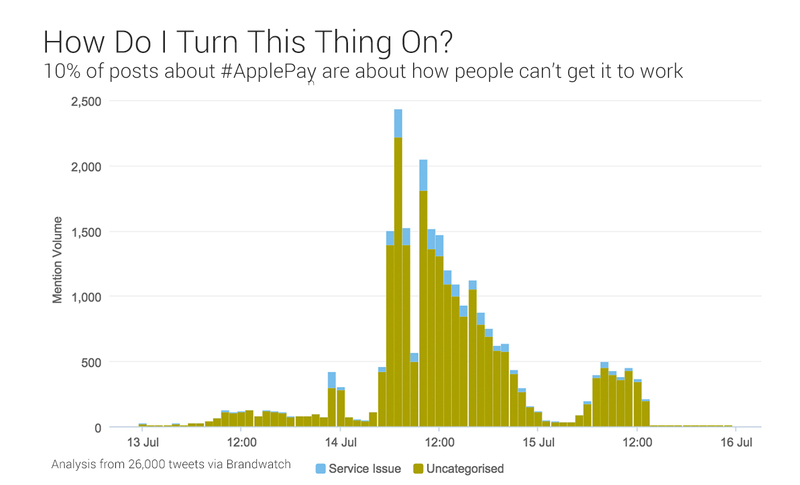 The most popular use of Apple Pay in the UK, so far, is on Transport for London’s bus, tube and rail network. People use it for TfL twice as much as Pret. TfL, Pret, Waitrose, Tesco and Boots are the top five brands with the most Apple Pay evangelists. Nando’s, Co-op, Subway, McDonalds and Starbucks have the least. 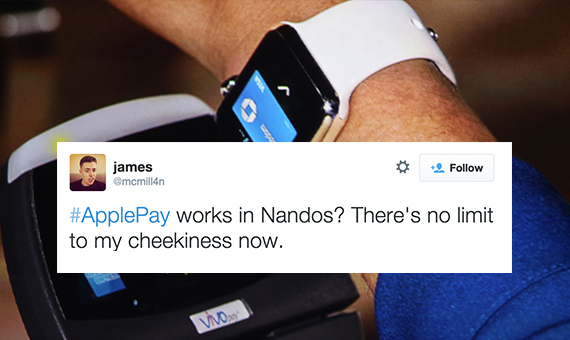 Already, people are struggling to get Apple pay to work. Rory Kellan-Jones, the BBC’s technology correspondent described the service as having “wrinkles.” He couldn’t use his iPhone to buy a small latte in the Café Nero next to the BBC’s W1A HQ. The video has been shared widely on social media. We analyzed over 26,000 tweets for this short study. 10% of all of them about how people can’t get the service to work. Retailers are getting caught in the firing line, too. When it comes to them, negative mentions almost outweigh positive ones. Some customers are complaining they have been charged twice, while others complain that their local stores don’t have contactless readers yet. Launching a service like Apple Pay involves a lot of big name stakeholders. If one link in tarnished, it casts doubt on the whole system. Getting a holistic view of customer opinions is vital. “One million halloumi wraps bought with Apple Watch” is a great headline, but it doesn’t tell the story of cursing into a Yoga Bunny Detox after the second failed payment attempt.